[A noble effort engendering civic pride in its thoughtful composition, use of materials and numerous artworks by leading practitioners of the day. Pevsner lists some of the materials - Portland stone, Broughton Moor, Cornish granite, Norwegian Otta slate, hand-made bricks, Rosso Levanto marble, and bronze. Designs were drawn up by the City Architect, G.W. Kenyon, building began in 1958 and the building opened in 1968. 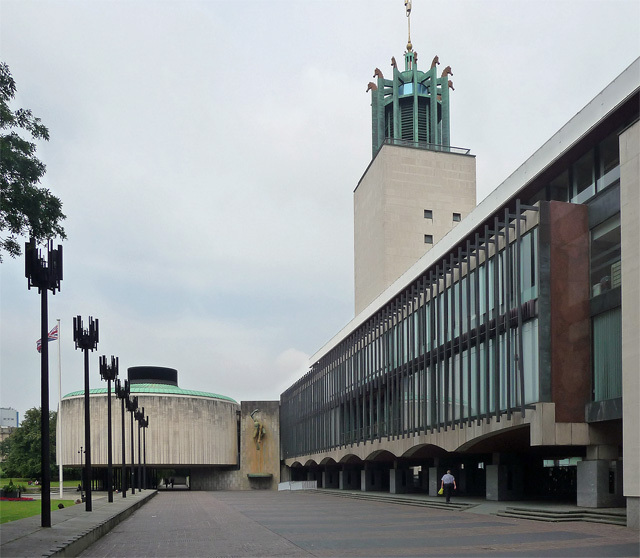 Ahead is the Council Chamber; to its right is the River God Tyne fountain (NZ2464 : Civic Centre, Newcastle Upon Tyne); see also NZ2465 : Newcastle Civic Centre - turret. Grade II* listed. *Pevsner quotes T. Dan Smith explaining that Pasmore was "let loose" in the Rates Hall because "I wanted people to go there, albeit reluctantly, to pay their rates, and to come face to face with Pasmore's abstract art ... As they fingered their cheque books or opened their purses, I longed for them to snarl "This is the end...". I believe that this is what the relationship between the artist and the individual is all about".] Photo by Stephen Richards, 2012, and licensed for reuse under a Creative Commons Licence.